Mabel L. Rice, PhD, is the Fred & Virginia Merrill Distinguished Professor of Advanced Studies at the University of Kansas. She directs the Merrill Advanced Studies Center, the Child Language Doctoral Program, and the NIDCD-funded Center for Biobehavioral Neurosciences of Communication Disorders (P30 DC005803). She directs the Language Acquisition Studies Laboratory, and is the PI on two longitudinal language acquisition studies funded by NIDCD (R01 DC005226, R01 DC001803). She is a member of the Scientific Leadership Group for the NIH Pediatric HIV/AIDS Cohort Study (PHACS, U01 HD052104) and a Co-PI on an NIH Small Business Tech Transfer grant (STTR, R42 DC013749) with Richard Ellenson. She also directs a NIDCD-funded training grant (T32 DC000052). She has been a Scholar-in-Residence at MIT, Harvard, the University of Potsdam, Germany, and Curtin University in Perth, Australia, and a Japan Fellow in Tokyo. Dr. Rice teaches graduate courses on language acquisition, language impairments in children, morphosyntax, research methods, and issues in the conduct of research. She directs the cross-disciplinary Child Language Doctoral Program, jointly sponsored by the departments of Applied Behavioral Sciences, Linguistics, Psychology, and Speech, Language, Hearing. She has an extensive record of mentoring doctoral and post-doctoral students. She has directed a T32 NIDCD training grant for more than 20 years and has directed training grants from NINDS and the Department of Education. She received the John C. Wright Outstanding Graduate Mentor Award. Dr. Rice's research focuses on language acquisition and language impairments, morphosyntax (grammar markers of language impairment), genetics of language, reading, and speech impairments; language acquisition and impairments in twins, language impairments in children affected by HIV, and language impairments in children with autism. Her research is multidisciplinary and internationally collaborative. Her lab is funded by NIDCD for an ongoing longitudinal, family-based genetic study of language acquisition of children with and without SLI (R01 DC001803), based in the Midwest, and for an ongoing epidemiologically ascertained longitudinal family-based genetic study of twins (R01 DC005226), with data collection in Western Australia. She enjoys and appreciates the support and contributions of scientific collaborators from Nebraska (Shelley Smith), New York (Richard Ellenson), Australia (Steve Zubrick and Cate Taylor), Washington University (Brad Schlagger and Steve Petersen), Switzerland (Javier Gayán), Tulane University (Russ Van Dyke), University of Illinois (Ken Rich) and Norway (Synnve Schjolberg), as well as the members of the Language Acquisition Studies Lab at the University of Kansas. She is a Partner Investigator of the ARC Centre of Excellence in Cognition and its Disorders at Macquarie University, directed by Stephen Crain. For her research she has been named a Fellow of the American Association for the Advancement of Science (AAAS), American Psychological Association (APA), Association for Psychological Science (APS), and the American Speech-Language-Hearing Association (ASHA). She also received ASHA Honors and the Alfred A. Kawana Council of Editors Award from ASHA. She is an Affiliate of the American Health Council. In her role as Director of the Merrill Advanced Studies Center, she organizes scientific conferences and dissemination of papers on research in public universities, and produces papers and edited books on emerging cross-disciplinary topics related to language, cognition and neuroscience. Dr. Rice served on the Advisory Council of the NIDCD, on the Communications Disorders Workgroup for American Psychiatric Association DSM-V, co-chaired the PhenX Speech and Hearing Working Group for the National Human Genome Research Institute, is a consultant for the Norwegian Institute for Public Health Longitudinal Study of Child Health Outcomes, and the Autism Speaks Treatment Advisory Board. She served as co-Chair for KU's Strategic Planning from 2012 – 2014. She serves on numerous editorial boards of professional organizations and on the Publication Board of the American Speech-Language-Hearing Association, with a term as Chair beginning in 2015. Rice, M. L. (2018). Language development: Learning from what children say . Open Access Government, 390-391. Rice, M. L., Russell, J. S., Frederick, T. Purswani, M. Williams, P. L., Siberry, G. K., Redmond, S. M., Hoffman, H. J., & Yao, T. (2018). Risk for speech and language impairments in preschool aged HIV-exposed uninfected children with in utero combination antiretroviral exposure. The Pediatric Infectious Disease Journal, 37(7), 678-685. Rice, M. L. (2018). Growing up with Specific Language Impairment. Open Access Government. Open Access Government. Rice, M. L. (2018). Language development: Learning from what children say. Open Access Government. Rice, M. L. (2018). Specific Language Impairment (SLI) versus Speech Sound Disorders (SSD). Open Access Government, 310-311. Rice, M. L. (2018). What twins can tell us about Specific Language Impairment. Open Access Government, 234-237. Rice, M. L. (2017). Specific language impairment: what do we know? Open Access Government, 34-35. Rice, M. L. (2017). Overlooked by public health: Specific Language Impairment. Open Access Government, 28-29. Rice, M. L. (2017). Lost for words: Investigating specific language impairments. Research Features,(105). Mabel L. Rice is an international authority on language disorders in children and the genetics of language acquisition. She directs three programs in the Schiefelbusch Institute for Life Span Studies and maintains an active research lab, carrying out collaborative studies at international levels. She is best known for her research on Specific Language Impairment. 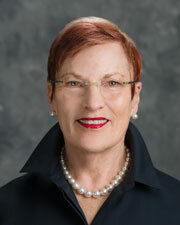 Mabel L. Rice is an international authority on language disorders in children and the genetics of language acquisition. In 2001, she was a Japan Society Fellow. In 2000, she was recognized as a Haydn Williams Fellow in Australia. She has been a visiting scientist at the Center for Cognitive Science at MIT, the Harvard Graduate School of Education, the Institut fur Linguistik at the University of Potsdam in Germany, and the Hopital de la Salpetriere in Paris. She is the former editor of the Journal of Speech, Language, and Hearing Research. At the University of Kansas, she directs the Child Language Doctoral Program, one of the first interdisciplinary programs in the country to train child-language specialists. She also directs the Merrill Advanced Studies Center and the Biobehavioral Neurosciences in Communications Disorders Center. She maintains an active research lab where students address fundamental questions about young children's language acquisition and language impairments. With Ken Wexler from the Massachusetts Institute of Technology, she developed the Rice/Wexler Test of Early Grammatical Impairment for children ages 3-8, published originally by the Psychological Corporation in 2001 and adopted for use by school districts and speech language professionals. It is now available free on this website – see above. Dr. Rice has investigated the disorder SLI and other language impairments with research funding from the National Institutes of Health. Currently, she directs a longitudinal study of a grammatical marker in children with SLI and their family members. This study includes a subcontract for genetics analyses with Shelley Smith at the University of Nebraska Medical Center - Omaha. She also leads a collaborative team with investigators Steve Zubrick and Kate Taylor at Curtin University in Perth Australia, in a large-scale study of the language acquisition of twins compared to single-born children, and their families. She collaborates with Richard Ellenson in an NIH STTR award to develop new language assessments.